I have recently upgraded my Windows XP computer to Windows 7. I use Putty connection manager to connect to Linux servers. It provides tabbed Putty sessions for connecting to Telnet/SSH servers. This tool has some issues specific to Windows 7 OS. I had saved the database file before upgrading to Win7 and imported the connections to Puttycm in Windows 7. Everything worked fine in the first launch. I was able to connect to the servers using the imported connection settings. But when I closed the Puttycm and launched it again, it had thrown the error ‘An unexpected error occurred. Access to C:Program FilesPutty Connection Managerputtycm.log’ is denied‘. I clicked on OK, then it opened puttycm.log which showed error message like below. I solved this problem by launching Puttycm with administrator privileges. For this, you can do the following. Open the properites of Puttycm.exe(Right click on Puttycm shortcut in Start menu or the file can be found in “C:Program FilesPutty Connection Manager” or “C:Program Files (x86)PuTTY Connection Manager“). 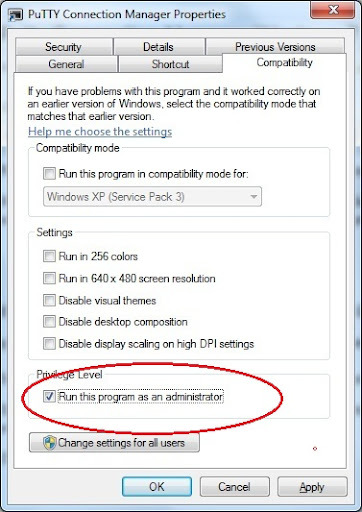 Elevate the privilege by selecting the check button ‘Run this program as an administrator‘. Click Apply and OK buttons. When you minimize PuttyCM, it disappears and clicking on the system tray icon won’t bring back the window. You can solve this issue by disabling the feature ‘Hide when minimized‘ in Tools -> Options -> General. When I try to connect multiple (4) connection externally, the login macro does not work on 1 or 2 of them, so I have to login manually. Can anyone explain the Macro Options? in putty 0.60 is there any way to add hot keys with text strings? First of all, this is great software. Someone spent a lot of time, effort, and brain power on this, and it’s FREE, so I’m giving credit where credit is due. A big thank you to the developer. On to the problem/solution. I closed PuttyCM by right-clicking on the icon on the Windows 7 (64 bit) taskbar and clicking close, rather than closing from within the app. After that I couldn’t get Putty to display/maximize when reopening. It just showed as an icon on the taskbar and icon in the tray but I could never get it to show on the desktop. Clicking on the icon(s) and Alt-Tab simply didn’t work. The value is an xml, I deleted everything b/w the opening and closing “DockWindows” tags, and that fixed it. What I deleted were a bunch of repeating “DockWindow” elements containing window docking position info that must’ve been messed up. As always, be extremely careful when modifying registry values. I saved the original value to a file before making the change. I also set key SaveDisplayConfig to zero (same as unchecking “Remember display configuration” in Tools/Options/General), hopefully as a safeguard. I notice there is also a “Reset layout” button under Tools/Options/Other. Bottom line, I will not be closing this app by right-clicking on the taskbar icon and selecting “Close window”. Brilliant!!! Thanks Thomas. This has been killing me for weeks now. I had to resurrect an old notebook just for Putty – painful!!! New Rule: No Right Clicking to Close!! Hi Thomas, I cant thankyou enough for this fix, its brilliant. I’ve been struggling with it for so long eventually giving up and living with a beta exe version loading it up on the fly. But now its working like a charm. Thanks a zillion !!! PuTTY Connection Manager out of HKEY_CURRENT_USER\Software\ACS (had to search to find it in Registry. My Puttycm is now coming up and not disappearing anymore. I have been fighting this for several months, even using the run as administrator was not enough. Thank you! Unable to open connection to X Host does not exist. 3) Execute Putty Connection Manager, it’ll ask you the putty path again (as asked when you install PuttyCM at 1st time)*, configure the putty path again. *If itn’t ask you, it’ll be necessary desinstall PuttyCM and putty, and install them again. I have the exact same issue. did you find a solution to this? I am getting same problem after changing my OS from Window XP to Windows 7. I have the same problem, any news about? In my Windows 7 SP1 set-up, I did not encounter this problem until I modified the text size (Control Panel, Display, Make it Easier to read what’s on your screen). Changing the setting from ‘smallaer – 100% (default)’ to Medium or Larger caused the error you described. If the text is too small, you’ll need to live with a lower screen resolution. How to increase the number of autologin commands which is currently set to 5, i need to increase it to atleast 10 is that possible or do we have the source code some where to modify this, if so please help. You can write all those commands in a shell script file and invoke the script in the autologin command. I will nto be ablet o run those from the scripts, since my inital login is only a restricted shell where i cannot execute any scripts. The only option left for me is to use the auto commands, if we cna increase that by another 3 or 4 would be great. Thanks for the solution boss!! i installed on pc running win7 and get bellow error can anyone help me. Please give me the solution if anyone knows. Thank you. This really helped. I have 50 cisco device which is connect using putty manager. My problem is, i’m using my AD user/password for those connection but every 2 month password need to be changed as per the standard. IS that way to decrypt the database using any database tool for changing the update password ? because the database format is .DAT not like sql ? I had such a big problem with Minimizing PuttyCM. I would not get up on the screen 90% of the times and I would end up killing it. I just did the tweak you mentioned and it seems to be fine so far. Fingers crossed. Thank you for sharing this, I’m not quite sure why you would even want a ‘hide when minimized’ option let alone set it as default. my laptop have been re-imaged and every time I open Puttycm it doesn’t open the Dat-file correctly, it opens in Acrobat reader and I don’t know where to change the settings. In this way the program is useless. The same file is working correctly on my workstation. I am having an issue with putty cm ver 0.7.1 beta(build 136) I enter my login and then it asks for my password and I continue to get “access denied” Userid and password are correct.. Any thoughts?? ?